Having been in your shoes as recruiters and job board managers, we know you’ll love operating a mobile-responsive and SEO-friendly job board powered by Careerleaf where you control your branding, content, business model, and revenue automation. You’ve found success with your audience, but the job board space is evolving rapidly. You’ve pushed your current technology to its limits and still find yourself vulnerable to falling behind in this ever-changing business. "Careerleaf’s CMS allowed my designer to carry over my brand to my new site." "I’ve looked at all the options and Careerleaf has the best experience for job boards users." "I was able to move all my feeds and tracking scripts without issue"
How can Careerleaf help me drive traffic to my job board? 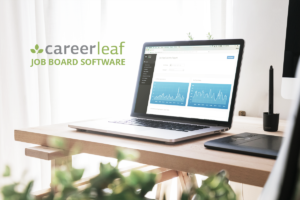 With a Careerleaf-powered job board, you have the advantage of SEO-friendly URL structures, access to SEO optimizing tools, Google for Jobs search compatibility, and the ability to create, optimize, and distribute content that helps candidates and employers discover your board and use it as a regular resource. Sign up with Facebook and our Jobs API Scripts combine to create a social media winning combination. What APIs and Integrations do you support Out-Of-The-Box? Careerleaf offers job inventory integrations with a wide range of providers, including Indeed, JobG8, Jobs2Careers, Neuvoo, and ZipRecruiter. We also offer social media sign up/sign in options for your candidates using Facebook and LinkedIn. Careerleaf makes it simple to add tracking codes to your job board to integrate with your favourite CRM, marketing automation or analytics tools. We also offer a direct integration with AgileCRM. Careerleaf’s Jobs API lets you put real-time job inventory on partner websites or in custom coded applications. Can I use my own designer to customize the look and feel of my site? With Careerleaf, you have the ability to monetize through job posts, featured job posts, featured employers, pay-per-click job backfills, and display advertising. You can also get creative and offer packages that include service add-ons, like job post writing/optimization, recruiting services, or referral agreements with other companies that offer services to job seekers and employers. If you want to switch to a newer, better solution for your niche job board, get in touch with us. You can request more information, access a demo, or have us call you for a quick chat.